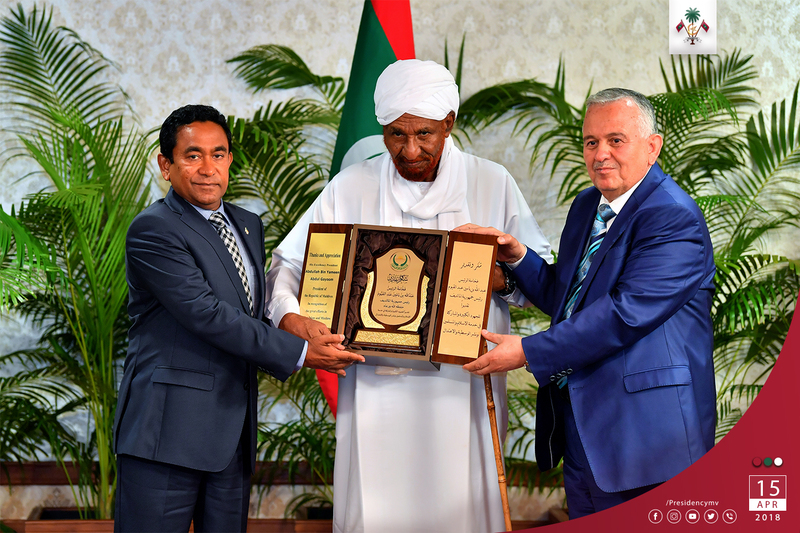 Male, April 15 (newsin.asia): The International Moderation Forum has given the Maldivian President Abdulla Yameen, an award for fostering moderate Islam and fighting radicalism and terrorism. The award was given at the President’s Office on Sunday. The International Moderation Forum promotes the true message of Islam based on humanity, and advocates combating the global scourge of terrorism, through a moderate Islamic vision, a statement from the President’s office said. Speaking at the function, President Yameen said that the Award adds incentive to bolster his efforts in counter-terrorism, and in the enhancement of moderation in the preaching and practice of Islam in the Maldives. Yameen said that Maldivians have reasons to unite to face the common threat to the Ummah today, and to counter debilitating forces from within and outside that tarnish the good name and true teaching of Islam. The Ummah should unite to resist those framing Islam as a cult-like deity that espouses violent revolts, the President said. He noted that the Maldives has made enormous strides in implementing substantial measures to foil radical thought, terrorism and violent extremism. He spoke about the establishment of the National Counter Terrorism Centre (NCTC) in 2016, and the enactment of the Prevention of Terrorism Act in 2016 as notable milestones. Yameen said that it is the world leaders’ ethical responsibility to enhance the power of moderation and tolerance in the Islamic world. “We have a duty to help our Muslim brothers and sisters who are displaced around the world. He made this statement while speaking at the ceremony held this afternoon, to confer the Award of Recognition to President Abdulla Yameen Abdul Gayoom, from the International Moderation Forum. The ceremony was held at the President’s Office. .Speaking at the function, President Yameen said that the Award adds incentive to bolster his current efforts in counter-terrorism, and in the enhancement of moderation in the preaching and practice of Islam in the Maldives. Yameen highlighted that the Maldivians have reasons to unite to face the common threat to the Ummah today, and to counter debilitating forces from within and outside that tarnish the good name and true teaching of Islam. The Ummah should unite to resist those framing Islam as a cult-like deity that espouses violent revolts. Previous recipients of the Award of Recognition by the International Moderation Forum include, the late King of Saudi Arabia, Abdullah bin Abdul Aziz and Former President of Mauritania, H.E. Mohamed Wildhu Abdulaziz.